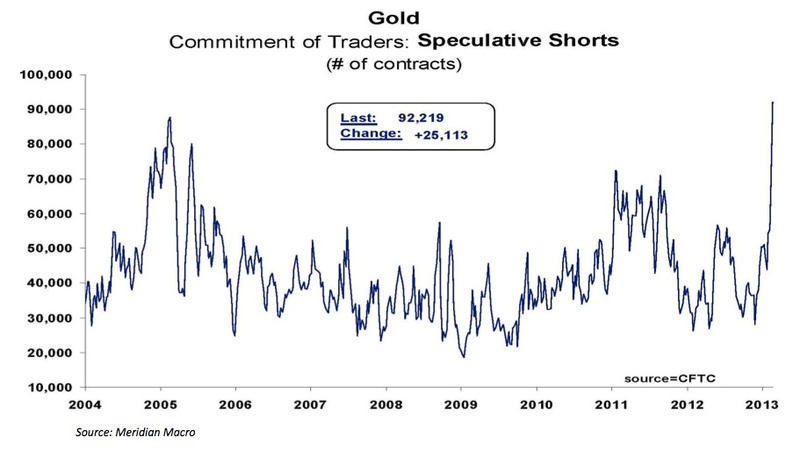 The following chart from John Hathaway sums up in the current sentiment toward gold in one simple picture. 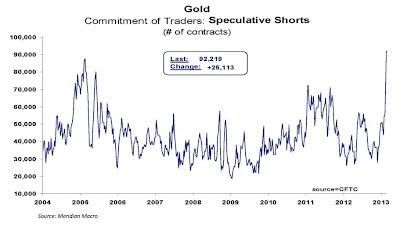 Last week we discussed the Daily Sentiment Index moving toward 94% bearish in precious metals (it got down to 97%), as well as the pure desperation (potential buying opportunity) in precious metal mining shares.. Today we have the commitment of traders gold short position which has gone parabolic as every trader around the world bets that gold is going lower. Meanwhile across the pond in Asia, the chart below shows that China continues to take advantage of every downdraft in paper pricing to accumulate real physical metal. While no one discusses this important story today it will become very important when we reach the final chapter of the currency wars and need to re-structure the entire global monetary system. It's important to note that a new monetary system is not going to bring "the end of the world" or some sort of apocalypse. It is just going to bring a change, and I believe this will be a change for the better for the general populace of the world. 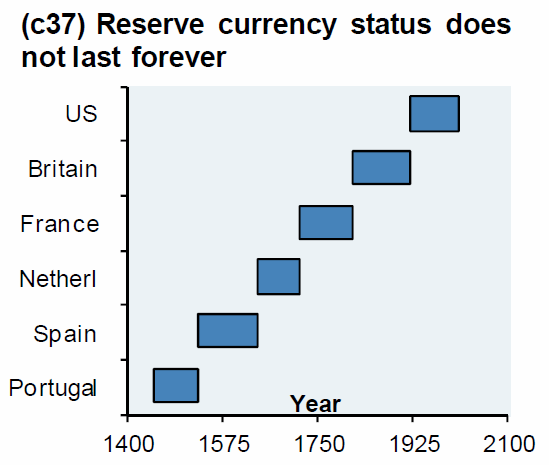 Those that have studied financial history know that a reserve currency status does not last forever. 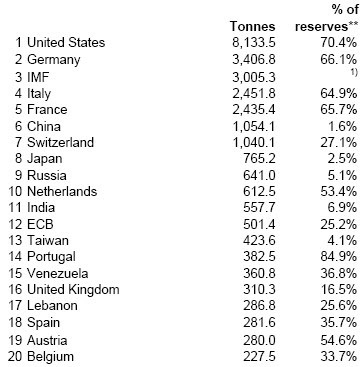 If you base your investment beliefs around the idea that the U.S. dollar will always be the reserve currency, you are taking a very short-sighted view. The following graph shows the change in reserve currency status over the centuries. The monetary system takes a new form and re-shapes itself on average every 40 years. The current system was put in place in August, 1971. China is simply placing their pieces on the chess board for the inevitable change, not the end of the world. 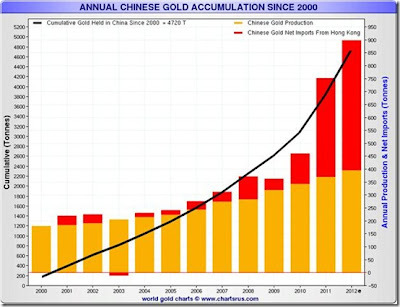 When China announces their new gold holdings it is going to shock many participants in the market. The following shows the IMF's official gold holdings by country, but China has not updated their holdings since April 2009. I believe they have at least double what is listed below as of this writing and perhaps more. Their goal is to quietly accumulate without triggering any alarm in the market (we can only track various import data such as the graph above). My advice? Think like China. Think beyond the current quarter of earnings announcements from Apple, IBM, and Walmart. Think about the end game and then work backwards in order to position yourself correctly.